Summary: From Hwy S22 at Arroyo Salado Primitive Campground you can 4WD or hike to the 17 Palms Oasis, 5 Palms Oasis, Una Palma and the Pumpkin Patch in Anza-Borrego Desert State Park. Last March I took a road trip to Anza-Borrego Desert State Park. 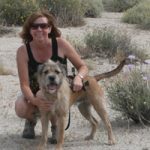 Our goal was to visit a couple of the palm oases near the Arroyo Salado Primitive Campground. This trip can be done by hiking or driving a 4WD vehicle. You can also add on the Pumpkin Patch (an area were you can view sand concretions) to this trip which is a geological point of interest in this area. We drove on this trip and we found it to be an easy 4WD route. There were several other visitors who were hiking in the area when we visited. If you have time to pack a lunch the 17 Palms Oasis is a great area to rest in the shade and to take in the scenery around you. The other areas don’t offer much shade. Make sure to take plenty of water and a camera! These areas are well-known watering holes for the regional wildlife of the Borrego Badlands. The palms at both Oases are often green and brilliant compared to the stark and barren desert that surrounds them. These verdant oases have attracted humans for thousands of years. Nomadic aborigines, wayfaring emigrants and determined prospectors have all taken shade and water from these islands in the badlands. Remnants of a time when grasslands, streams, and herds of camels and mammoths covered an ancient landscape, the native palms exist today only because water surfaces here. As the spring here was unreliable, early travelers with extra water would leave it in large glass jars. Thirsty visitors came to rely on the jars hidden in the shade of the palms. The desert wanderers would leave notes attached to the jars. Today the custom of leaving messages in the prospector’s post office is carried on by visitors. 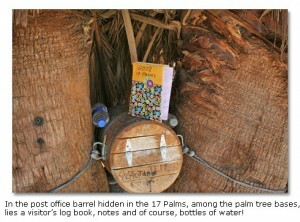 In the post office barrel hidden in the 17 Palms, among the palm tree bases, lies a visitor’s log book, notes and of course, bottles of water! 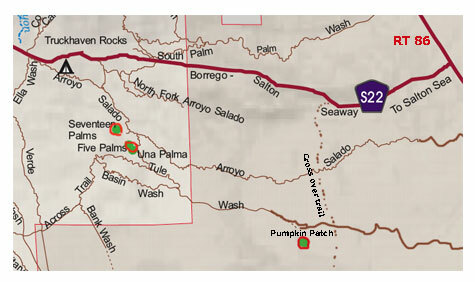 The 17 Palms area is located off of the S-22. Take the Arroyo Salado Primitive Campground turnoff, travel approx. 3.6 miles on Arroyo Salado Wash to the Seventeen Palms Turnoff which puts you on Tule Wash (you will see a small sign with arrow heading West (right) and travel another 0.2 miles to the 17 Palms parking area. 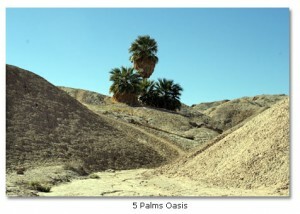 To visit the 5 Palms Oasis continue past Seventeen Palms on Tule Wash to arrived at the Parking area for 5 Palms. Una Palma can be reached by walking over the ridges of the 17 and 5 Palms locations. Or you can go right on Cut Across Trail to arrive at the Una Palma Location. Make sure you use a park map to verify all locations. To read the full story about this area, including the history of the Truckhaven Trail and information about the Pumkin Patch visit our DesertUSA web pages.